Although there is a Jewish population in Spain of just under 50,000 people, Jewish communities tend to be centred round areas other than the Canary Islands. The two major centres of Jewish life are Madrid and Barcelona, both with around 3,500 Jews. Closely following are the centres of Malaga, Alicante, Benidorm, Cadiz, Granada, Marbella, Torremolinos and Valencia. As you'd expect, some of these places will have a synagogue. Unfortunately for Jewish people visiting (or living in) Tenerife, the island doesn't appear to have one. 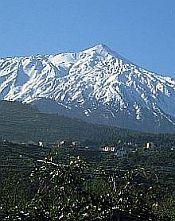 Several Jewish websites, however, tell of a synagogue on the Canary Island of La Palma. Try as I might, I can't discover its location, but I have been informed by someone, via the "feedback" facility, that it does exist and is in operation today. There is a non-jewish website I've come across that claims that there is a synagogue in Santa Cruz, Tenerife, on "Calle Bethencourt". Apparently, there was one there many years ago, but it is long since closed down. Anyway, back to the one on La Palma. There are three ferry companies connecting the different Canary Islands and it's possible to sail from Tenerife to La Palma with all three. The journey can take up to 2 and a half hours. Details of these companies can be found here. There is a company called Klub Premiere that operates kosher holidays all over the world. They operated, a few years ago, a trip to Tenerife, staying at the Hotel Botanico, that was fully kosher. Unfortunately, it seems that this company no longer includes Tenerife in its holiday destinations. In fact, their website seems to not exist anymore, which is a shame. If any other companies come to light, I'll let you know. At the time of writing, I've not managed to unearth any kosher restaurants in Tenerife - but I bet there are some! If any come to light in the future, I'll insert them here.